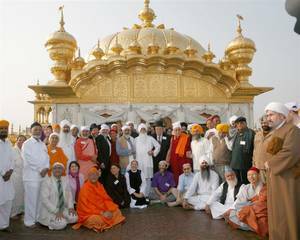 The Elijah Board of World Religious Leader held its third bi-annual meeting in Amritsar, India, November 26-30, 2007. The meeting was hosted by the Guru Nanak Niskam Sewak Jata, headed by Bhai Sahib Mohinder Singh. This Birmingham based group extended the most memorable hospitality to all participants. Volunteer cooks flew at their expense to India in order to be able to serve participants with love. Many other volunteers from the community were involved, thereby making it a community-wide event. The meeting was scheduled to take place in part in Dharamsala, where His Holiness the Dalai Lama was to host us. Due to changes in his travel plans, he was unable to host us there. Nevertheless, he retained, in some sense, his status as co-host of the meeting. In addition, he spent almost the entire meeting with the group, which far exceeds his usual involvement as well as his earlier commitment to this group. It was made clear to us that this is a sign of how much he believes in the work of this group and how excited he was to be a part of it. The location of the meeting certainly played a part in its charm and success. The newly inaugurated Sikh conference center is only a block away from the Golden Temple complex. Vistas of the Temple complex can be seen from the rooms and the roof. Participants were able to walk to the Temple at various hours, particularly in the early morning hours to benefit from the inspiration of the faith and practice of the Sikh community. One of the participants remarked that Amritsar is the only city in India in which one does not see beggars, due to the Sikh system of offering free meals at their temples, as part of their community ritual. These meals are offered to all alike, rich and poor, thereby removing the social marks of distinction that could get in the way of successful support of the poor. Sikh spirituality, hospitality and piety informed the entire meeting, within the conference center and outside it. 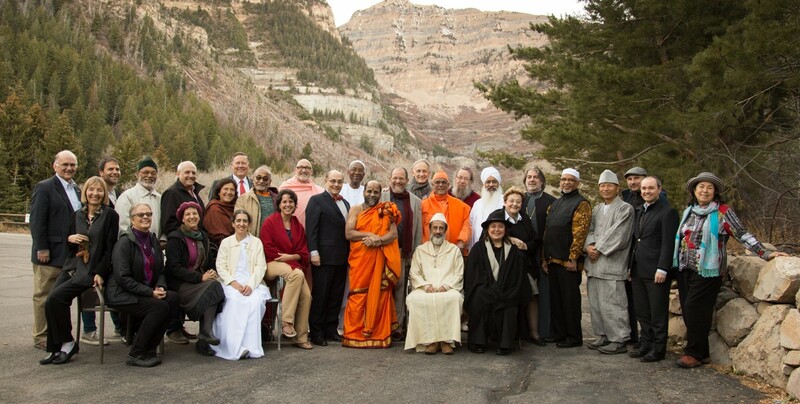 As in previous meetings of the Elijah Board of World Religious Leaders, the leaders have met following preparation by a think tank, created by the Elijah Interfaith Academy. The think tank, comprising 12 scholars from 6 religions, met in June at the Fetzer Institute, in Kalamazoo Michigan. 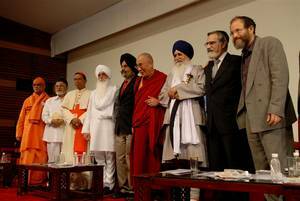 Following the meeting, 6 position papers on the theme “Sharing Wisdom: The Case of Love and Forgiveness”, were prepared, representing the perspectives of Sikhism, Hinduism, Christianity, Islam, Judaism and Buddhism. These papers, together with a summary paper, pointing to the commonalities and accomplishments of the project, were disseminated in advance of the meeting. The meeting was divided between work in small groups and in plenary. Thematically, the discussions explored the various aspects related to sharing wisdom – what is wisdom; why share; dangers in sharing; what we would like to share. It was clear that the high point of the meeting was the almost day long discussion of what we would like to share. The issue was formulated as follows: what have we learned from another tradition that we would like to bring back to our own community? This formulation shifted attention from what each tradition would consider its gift and contribution to others to a more personal statement that made room for acknowledging what had been received and what had been learnt from others. The focus on bringing it back to the community allowed the leaders to reflect as leaders of communities and not simply as individual religious personalities. There was unanimity that our process must be brought down to community level. This is particularly so in view of the strong sense of bonding, community building and personal transformation that accompanied the meeting. Discussions followed from the more theoretical reflections on sharing wisdom to one particular case of sharing, on the theme of love and forgiveness. Discussions explored the theoretical basis for forgiveness and touched upon specific cases of communities, in relation to one another, that required forgiveness. His Holiness the Dalai Lama offered an extensive reflection on the philosophical basis of his own practice and attitude towards the Chinese, who occupy his country. This was both theoretical and personal. Observers commented that they had never heard him speak in such detail and such depth when addressing outside audiences, and that this form of teaching and depth is usually reserved for his teaching within the community. Those observers took this as a sign of the degree of comfort the Dalai Lama felt within our group and as confirmation of the sense of intimacy and depth that he attributed to this specific gathering. The cycle of work from small group to plenary was expanded to include the public at large. One afternoon was devoted to a program at Guru Nanak Dev University. The program consisted of a public forum, on the theme of "How Should Our Religions Share Their Wisdom". Speakers from each of the traditions shared with the public the gist of the process the group had engaged in. The meeting was attended by hundreds of students and visitors to the university and was extensively covered by the media. The final day was thus devoted to a visit to Dharamsala . The visit included the local Temple, Museum, Tibetan Parliament in exile and cultural centers. We were received by the minister of religious affairs. The visit to Dharamsala was much more than a tourist visit. It has been our custom to incorporate touring to religious sites as part of the educational experience of these meetings. The educational opportunities provided by this tour were immense, making the tour highly enriching. His Holiness the Dalai Lama, India: "This is the most intimate and most profound interfaith group in whose work I have been involved. Elijah is Unique." Rabbi Awraham Soetendorp, Holland: "In Elijah, the careful preparation by a panel of scholars of background papers, delving into the subject matter (in this latest case: Sharing Wisdom),summarising the results of dialogues in the past and adding a personal evaluation, all this paves the way for those who take up responsibility of religious leadership to listen and speak more with their heart. To take up a fresh approach, to achieve together a deeper understanding of the other and to strengthen mutual trust. Thus a spiritual event is engendered that allows for personal discovery, the search for new meaning, in a self-critical, yet unassuming, manner. Thus gradually a community of religious leadership forms itself." I see in Elijah the emergence of a true council of religious leaders that is able and granted to assume the so much needed role of moral leadership. Elijah mourns the passing away of Daniel W. Hardy of Cambridge University. Dan was a member of Elijah’s academic advisory board and followed Elijah’s development with care and passion since its establishment. Dan was an ordained Anglican Theologian, associated with the General Theological Seminary, University of Birmingham and the Princeton Center of Theological Inquiry, where he served as the director, and where I (Alon Goshen-Gottstein) first met him. Dan’s interests in Wisdom and its relationship to love were closely related to Elijah’s own emphasis on the wisdom of faith traditions. He was one of Elijah’s wisest counselors and will be sorely missed. The following declaration captures the spirit of the Amritsar meeting. We would be grateful if you could help disseminate this declaration. Kindly consider posting it on your department’s bulletin board, sharing it with your friends, your e-lists, etc. Please become our partner in sharing the fruits of our deliberations with others. We, the Board of World Religious Leaders, representing 6 of the World’s great Religious Traditions, have just concluded our third biennial meeting. This gathering in Amritsar, the holy city of Sikhism, was characterized by a profound sense of openness, mutuality, respect for one another’s faith, and trust. The sense of shared spiritual longing pervaded our deliberations our and our commitment to taking our learnings from our meeting to the larger world infused our discussions. There was both an intimacy to our discourse and expansiveness to our vision. Through this Declaration, we invite others to join with us in affirming the profound Wisdom of our religious traditions and how that wisdom can inform the world. Our meetings have not taken place in a vacuum. We are building on the insights of the previous meetings of the board and of the august Think Tank of scholars whose teachings guided our work. We have previously articulated the many and often overwhelming needs which we feel mandate our attention. In light of our earlier statements, we, the teachers of wisdom of religious traditions acknowledge that none of our traditions is exempt from the responsibility to address the crises of our time. Although there are no facile solutions to the ills of the world, we must reaffirm our commitment to do all we can to alleviate present suffering and to contribute to a solution of those problems that we can address. We wish to state our recognition that in the world’s present state, all traditions have become interdependent, and must therefore face the challenges of the world in a collaborative manner. We wish to affirm our belief that within our traditions are resources of wisdom that can speak to the ills of society and the misuse of religion. We wish to call upon all our religions to offer their finest teachings as resources to guide humanity to safe harbor, and to identify the teachings they can jointly offer a suffering humanity. We wish to further call upon practitioners of all religions to become aware of the life wisdom and spiritual wisdom of all religious traditions, as a means of obtaining a truer understanding of other religions, in the service of peaceful living. We invite thinkers and religious leaders to explore the possibility of addressing their own internal crises in light of the experiences and accumulated wisdom of other religious traditions. · Sharing Wisdom should never lead to the violation of the integrity of religious identity. Sharing wisdom is not a means of influencing others to change or abandon their religious identity, either willfully or by coercion, but rather an invitation to deepen it and become more faithful to it. · Sharing Wisdom has a broad universal mandate, almost a human right, grounded in the dignity of the human being, as understood diversely by our religious traditions. It is closely related to the right of religious freedom. As a spiritual process, it should be broadly open, beyond considerations of gender, caste and other forms of limitation. · Sharing Wisdom should respect the integrity of religious teachings. It should not lead to the cheapening of teaching, nor to the loss of authenticity. Consequently, care must be taken to be mindful and respectful of broader theological structures, within which wisdom is couched, and to the internal processes, commitments and conditions that are necessary for successful realization of the age old wisdom of religious traditions. · Sharing Wisdom implies responsibility on the part of leaders. Our words and our actions should be accompanied by careful consideration of what forms of wisdom are most suitable to broad sharing with others, so that wisdom is always shared with value and integrity. It is our faith that the ills of the world and the abuses done in the name of religions may be addressed through an attitude of openness to sharing and learning from one another. In an increasingly interdependent world we are called to share our wisdom, to offer it to others, and to listen to what they in turn have to offer. It is our sincere hope and prayer that such sharing, carried out in the right spirit, will make our traditions better vehicles to achieve their designated purpose and will make the world a better and more peaceful place in which our religions and humanity can flourish.